American Red Cedars are of two types: Eastern are junipers, while Western are cypress. Yet both have similar fragrant woods and leaves, and similar uses. Naturally resistant to insects and rot, many Native Americans depend on cedar wood as a reliable craft material. 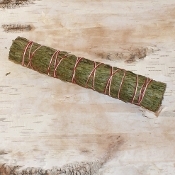 Several Tribes agree that cedar posseses important cleansing properties in ceremonial use. 2 oz. 8" L.